In September 2014, thousands of residents took to the streets during one weekend to protest against the development of a proposed garbage incinerator in Boluo County, Guangdong. Following the protest, 24 protestors were detained. In Sept 2014, thousands of residents took to the streets during one weekend to protest against the development of a proposed garbage incinerator in Boluo County, Guangdong . Following the protest, 24 protestors were detained. With its growing population, waste treatment has becoming a serious problem in China, which has been worsened by massive shipments of rubbish from other developed countries. In recent years, the Chinese government has initiated waste-to-energy projects in order to develop renewable sources of energy, many of which have been protested by Chinese residents fearful of their toxic byproducts (ibid). According to the Boluo government, the proposed incinerator will generate power by burning 700 metric tons of waste of day. Its pollution will be kept minimal. However, most Bolou County residents remain skeptical of such promises. “Of course, the government would say it’s safe,” said one of the residents who helped write the public appeal to the New York Times. “But if the river here is polluted, then we’ll all be harmed, and there’s also the problem of air pollution from the dioxins" (ibid). and “No incinerator on the banks of the Dongjiang river!” Others held homemade placards saying: “Boluo is my home,” and “The future depends on us all.” A Boluo county resident surnamed Hou said the protest had started peacefully, but then escalated into violence as riot police moved in to clear the area. “The armed police from the local police station blocked our path as we were marching, and there were some army personnel there too,” Hou said. The protests in the town in Boluo county illustrate the increased concern and anger Chinese residents share over the environmental hazards that such projects inevitably pose. Furthermore, many are frustrated by the lack of public forums for them to voice their concerns, or to influence government decision-making . "I am worried about the impact it may have on the water source," said a local resident who only gave his family name, Chen, for fear of possible government retaliation. "Burning will definitely cause air pollution. We are concerned about the health of our children" (ibid). The second protest was reported by witnesses to be orderly, until police snatched banners from the protesters, dispersed crowds by force and detained some demonstrators . The protesters stated that the government had not only censored media coverage of the protest, but also sought to dissuade those on public payrolls from joining in. Why? Explain briefly. The Huizhou Daily, the official newspaper of an area that includes Boluo, quoted a government spokesman who denied that the proposed plant’s site had already been decided and hinted at some leeway in resolving the matter . 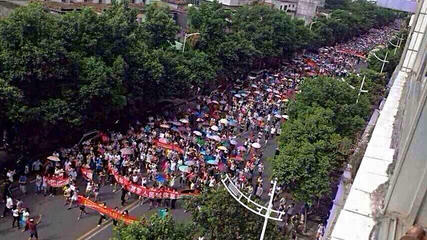 Chinese increasingly protest projects that threaten environment, 16 Sept. 2014. By Stuart Leavenworth - McClatchy Foreign Staff.